A very early mapping of Iowa with vast American Indian territories and an early county structure. 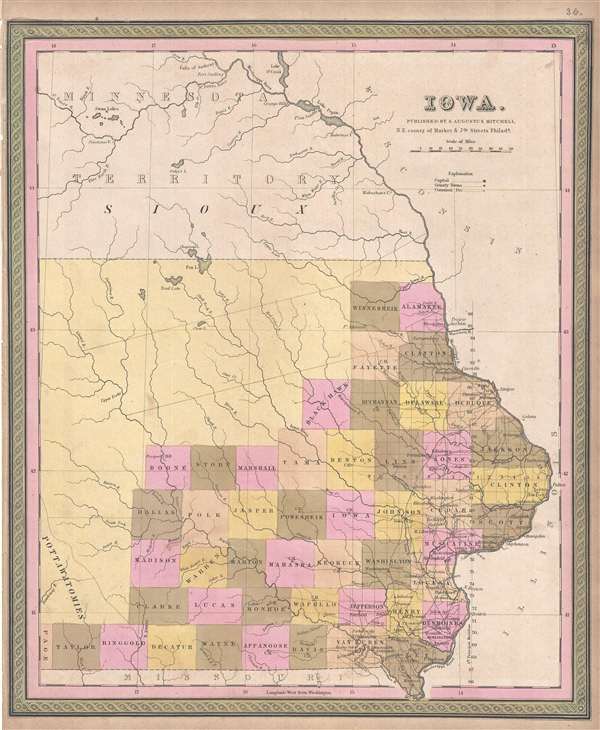 This is a Samuel Augustus Mitchell’s 1849 map of Iowa. The map covers the eastern parts of modern day Iowa with county platting limited to the southeastern quadrants. The remainder of the state depicted is devoted to American Indian Nations. The map identifies towns, rivers, roads and other topographical features. Iowa was admitted to the Union on December 28 of 1846 and around the same time the Sac and Fox largely withdrew from Iowa - a legacy of the 1832 Black Hawk War. The Sioux meanwhile ranged far and wide in northern Iowa, including deep into Sac and Fox territory. The U.S. Government subsequently established a Neutral Ground roughly 40 miles wide and enforced from Fort Atkinson, as a buffer zone between the two tribes. That regions is shown here as two parallel lines extending across the map from the Mississippi to the Lizard River. The whole is engraved and colored in Mitchell's distinctive style with green border work and vivid pastels. This map was issued in the 1849 edition of the S. A. Mitchell's New Universal Atlas. This was the last edition of that atlas to be published by Mitchell prior to selling the plates and rights to Thomas Cowperthwait late in 1850. Very good. Left margin narow, as issued.